Background: Heart transplantation remains the definitive therapy for patients with advanced heart failure; however, owing to limited donor organ availability and long wait times, continuous-flow left ventricular assist devices (LVADs) have become standard therapy. 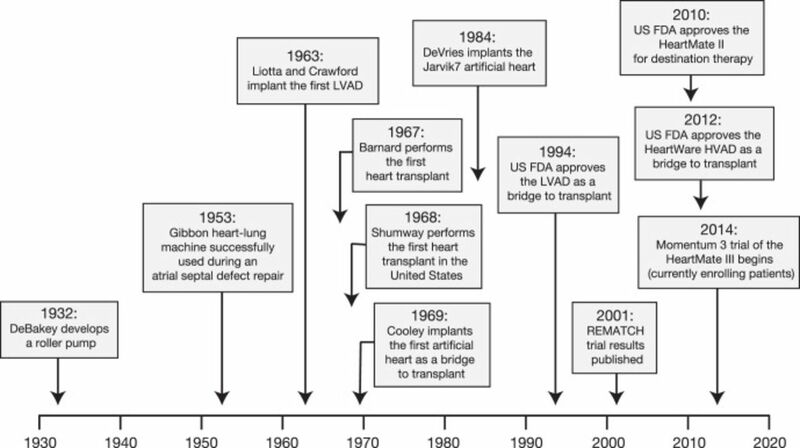 Methods: This review summarizes the history, progression, function, and basic management of LVADs. Additionally, we provide some clinical pearls and important caveats for managing this unique patient population. Results: Currently, the most common LVADs being implanted in the United States are second- and third-generation devices, the HeartMate II (Thoratec Corp., St. Jude Medical) and the HeartWare HVAD (HeartWare International, Inc.). A newer third-generation pump, the HeartMate III (Thoratec Corp., St. Jude Medical), is designed to create an artificial pulse and is currently under investigation in the United States. Conclusion: LVAD use is promising, will continue to grow, and has become standard therapy for advanced heart failure as a bridge to recovery, as destination therapy, and as a bridge to transplantation. Heart failure is a broad spectrum of disease and ranges from patients who do well for many years with oral therapy to patients who require cardiac transplantation. For patients with advanced heart failure, multiple options are now available, including inotrope support (both inpatient and outpatient), cardiac transplantation, and long-term mechanical circulatory support (MCS). In the past, providers have referred patients for CF-LVAD implantation, and the implanting center often managed most care postimplantation. However, because of improved survival, the increased number of implantations, and the increased number of patients with destination therapy, the concept of shared care has emerged.3 Shared care involves community physicians assisting in the long-term care of patients with CF-LVADs. As the numbers in this special population have increased, it has become crucial for the general cardiologist and internist to become familiar with this evolving technology. This review provides a fundamental understanding of the history, progression, function, and basic management of LVADs. Additionally, we provide some clinical pearls and important caveats for managing this unique patient population. Landmark events in the development of left ventricular assist devices and cardiac transplantation. FDA, US Food and Drug Administration; LVAD, left ventricular assist device; REMATCH, Randomized Evaluation of Mechanical Assistance for the Treatment of Congestive Heart Failure. During the past several years, these devices have moved from pulsatile flow to a continuous-flow technology. The benefits of continuous-flow devices include being one-seventh the size of the original devices, one-quarter the weight, and quieter with a smaller percutaneous lead and improved durability. Currently, the most common LVADs being implanted in the United States are second- and third-generation devices, the HeartMate II (Thoratec Corp., St. Jude Medical) and the HeartWare HVAD (HeartWare International, Inc.). A newer third-generation pump (HeartMate III; Thoratec Corp., St. Jude Medical) designed to create an artificial pulse is currently under investigation in the United States (Figure 2). 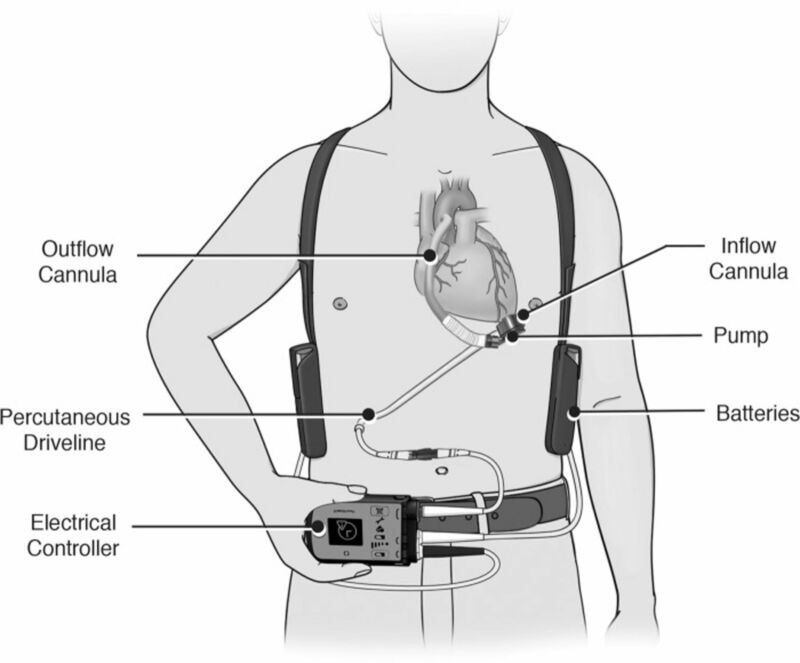 Left ventricular assist devices currently available in the United States. aThe HVAD trial for the DT indication was completed in 2015 and is awaiting FDA approval. bThe trial ongoing in 2016 for BTT and DT indications is the Momentum 3. BTT, bridge to transplantation; DT, destination therapy; FDA, US Food and Drug Administration. Images reproduced with permission from Thoratec Corp. and HeartWare. Basic left ventricular assist device components. Image reproduced with permission from Thoratec Corp. Blood is then actively pumped through an outflow valve into the ascending aorta. The pumping chamber is placed within the abdominal wall or peritoneal cavity. A percutaneous driveline carries the electrical cable and air vent to the battery packs and electronic controls that are worn on a shoulder holster and belt, respectively.7,8 Many considerations affect the evaluation of a patient for advanced mechanical therapy. Common contraindications for LVADs are summarized in Table 1. Patient selection and the timing of implant are key determinants of success for LVAD therapy. With few exceptions, patients with New York Heart Association (NYHA) functional Class IIIb/IV and American College of Cardiology/American Heart Association (ACC/AHA) stage D heart failure should be referred for evaluation for long-term MCS and cardiac transplantation. In addition, the current classification of patients with NYHA Class IV symptoms does not accurately define patient clinical risk profile. In this regard, the Interagency Registry for Mechanically Assisted Circulatory Support (INTERMACS), the largest LVAD registry in the United States, has defined patient profiles that can help identify risks associated with the timing of implant (Table 2).12-14 These profiles are particularly important because current data indicate that patients in profile 1 (severe cardiogenic shock) have the lowest survival, and patients in profile 3 (stable on inotropes) have the best survival.12 This information implies that patients with cardiogenic shock may be too sick for permanent LVAD support and instead should be managed using temporary percutaneous MCS to optimize their condition prior to consideration for permanent LVAD placement. For these reasons, many centers have adopted the practice of LVAD implantation earlier in the progression of heart failure (eg, INTERMACS profiles 2-4). Data on post-LVAD outcomes of patients with INTERMACS profiles 4 and higher are lacking; therefore, no recommendations exist for these subgroups. As the use of MCS continues to increase in patients with advanced heart failure, primary care providers and general cardiologists must become familiar with several of the unique characteristics of this patient population. With the increasing age of the population, the prevalence of heart failure continues to grow. Heart transplantation remains the gold standard of care in treatment; however, the demand continues to exceed the consistently inadequate supply. LVAD use is promising, will continue to grow, and has become standard therapy for advanced heart failure as a bridge to recovery, as destination therapy, and as a bridge to transplantation. Questions regarding MCS are shifting from which patients are candidates to receive an LVAD to how to choose the proper LVAD for an individual patient and how to prevent the complications of thrombosis, stroke, and pump failure. Because of the increasing use of MCS, primary care physicians and general cardiologists must learn how to assess and care for the basic needs of this unique but growing patient population. DeBakey Contributions to Medicine . Baylor College of Medicine. https://www.bcm.edu/about-us/debakey-museum/legacy-of-excellence. Accessed June 16, 2016.